While trying to focus on preparing for class on Wednesday, within minutes of each other I read an e-mail from the National Association of Evangelicals and a post from the Voice of the Martyrs which stood in stark contrast and jarred me a bit. First, the e-mail from the NAE. It wasn’t a bad e-mail. The title read, “New International Version Tops List.” The title grabbed my attention for a number of reasons. First, the Bible is my life. I’m a Christian, a minister, a chaplain and a Bible student. I live my life and vocation within the pages of the Bible. Second, I really like the NIV. I’m a Nazarene and prominent Nazarenes were on the editorial committee of the NIV. It makes it feel more like “my church’s Bible” (though I realize that the Nazarenes involved were among many other scholars from many other denominations). Third, the NIV is the Bible that I preach from. I am one of those mentioned who have made the NIV top the list (though I generally study in the NASB). Finally, I’m always interested in reading about Bible versions and translations. I have in my library 85 or so Bibles (or pages of ancient Bibles) in 31 different versions and about a dozen different languages. I don’t think that these even include my “every day” Bibles sitting around the house or the multiple Bibles that my family has. I followed the link to a New York Times article and learned more about the North Korean woman who said this. She is 52 years old and raises pigs. In fact, “she wakes up each day at dawn to scavenge for edible greens, then returns home to tend the family’s pigs. Her other vocation, carried out in secret, is making homemade spirits, brewed from acorns and corn cobs, that she sells to wholesalers” but apparently it’s not enough, she has two sons who suffer from malnutrition. There were three other North Koreans being interviewed along with this woman while they were in China. According to the article, “they were all anxious about speaking out; the gulag awaits those who speak to journalists or Christian missionaries, they were warned during two-day orientations that preceded their departure.” This is what we’ve come to expect in the West. Those under repressive regimes don’t have the freedoms that we have, not the least of which is the freedom of speech. 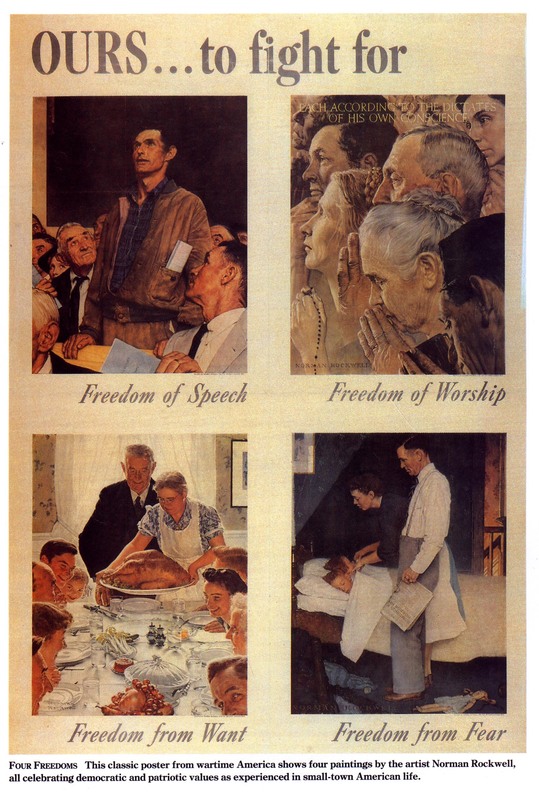 It’s usually those four freedoms that President Franklin Roosevelt spoke about back in 1941 (and Norman Rockwell made famous through his art work) that get our attention: freedom of speech, freedom of worship, freedom from want and freedom from fear. But have you considered that the freedom to read the Bible is restricted to the point that some people could be killed if they are caught? So here I am with my 80 some odd Bibles, more than I could read, some I don’t use but for reference. I carry one to school and to church -out in the open- without fear. I read it whenever I like. A man was going down from Jerusalem to Jericho, when he was attacked by robbers. They stripped him of his clothes, beat him and went away, leaving him half dead. A priest happened to be going down the same road, and when he saw the man, he passed by on the other side. So too, a Levite, when he came to the place and saw him, passed by on the other side. But a Samaritan, as he traveled, came where the man was; and when he saw him, he took pity on him. He went to him and bandaged his wounds, pouring on oil and wine. Then he put the man on his own donkey, brought him to an inn and took care of him. The next day he took out two denarii and gave them to the innkeeper. ‘Look after him,’ he said, ‘and when I return, I will reimburse you for any extra expense you may have’ (Luke 10:30-36, NIV). In response to Jesus’ question, “who was the neighbor?” the expert in the law said it was the one who showed mercy. I think that we can also flip that answer over without doing injustice to the text. Since the one who showed mercy was a neighbor to the one in need, we could also say that the one in need was a neighbor to the one who showed mercy. If one was a neighbor to the other, than the other is also a neighbor to the one. I think that being a neighbor can be both the one in need and the one who meets the need. “Neighbor” is a relationship that can include people without needs and those with needs; people with needs and others who can help meet those needs. What does this mean for us? What I think it means is that woman in North Korea who could be killed for reading her Bible is our neighbor. My neighbor. Your neighbor. How can we sit back with all of our freedoms and our Bibles while our neighbor lives in fear? How can we not be a neighbor to her? Awareness is one thing (and an important thing) but we should do something, right? But what exactly? Some things, though, seem obvious, like prayer. Others are more difficult, like giving financially to groups that try to help (like The Voice of the Martyrs or the Church of the Nazarene). Some ideas that may come to your mind are downright dangerous . . . like actually going to a country, to a people who needs you. Maybe all God wants of you is prayer. Or, maybe He also wants you to give. But maybe, just maybe . . . He wants you to go.